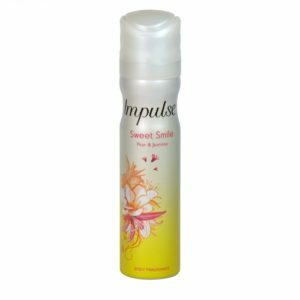 Impulse was known, some years ago, for offering a good range of body sprays and fragrances perfect for teens who were short on the kind of money that perfume goes for, but wanting something sweeter scented than the more utilitarian deodorants and antiperspirants of the time. One of our older ladies had fond memories of the Impulse range and eagerly volunteered to take a trip back to her girlhood by reviewing this product. There are few promises on this small aerosol spray: merely a terse ‘dermatologically tested’ and ‘gentle on skin’ along with the rather cryptic ‘duft deodorant’ for which our tester could find no explanation, even on the Internet. Our tester admired the slim-line, elegant aerosol can, delighted with the pretty crystal-hearts with swirls motif on the front. An innovation from the last time she had tried a can of Impulse was the twist-to-close top, which keeps the deodorant from leaking when carried in a gym-bag or handbag. This was also a positive point: sadly, the last of this review. Our tester, recalling her youth, applied the body fragrance with perhaps too heavy a hand on first application, and almost immediately regretted it. The spray stung the tender skin of her (freshly shaved) underarms, a feature she remembers from her youth, but that she had hoped would have been eradicated in the intervening years. The next problem was with the actual scent: it was very strongly chemical with a faint hint of pretty floweriness over the top. Our tester is mildly asthmatic and found that the heavy squirt of Impulse that she had used was enough to bring on some tightness and wheezing – easily manged with her inhaler, but unpleasant and unexpected never-the-less. With each day’s application, our tester became more and more disenchanted with the Impulse body fragrance, finding that it irritated her nose, and that smell’s unpleasant chemical overtone clung to her skin and clothes, wafting out at various moments of the day. The scent is very strong and lasts a long time, sadly for our tester, she spent much of the time wishing it would wear off or counting down the minutes until she could bathe or shower. The spray bottle is easy to use and features the twist close feature that keeps the contents where they belong. It is a simple matter to line up the nozzle with the target area and apply as needed. The slender can is lovely and smooth, nice to touch, and is small enough to easily carry around all day. The colours blend from dark blue into silvery white and the heart crystal image is elegant and pretty, sure to delight anyone who sees it. This spray is very cheap at just one pound, and the contents are strong enough that not very much is needed. The can will last a reasonable amount of time if used correctly. While our tester soon grew to loathe it, her teenage granddaughter thought the scent was pretty and could not discern the chemical tang that so upset her grandmother. One, our tester decided, to leave for the younger generation.